When Mayor Vincent Gray launched his Sustainable D.C. initiative in 2011, he proclaimed that he “wanted to make the District the healthiest, greenest, and most livable city in the nation” (Office of Planning and Department of Energy & Environment, 2012). Washington, D.C. is certainly on track to become these things, but not all parts of the city are equally healthy, green and livable. This paper aims to look at the city as a whole and as broken down by districts, to understand how geographically, Washington D.C. incorporates healthy design into its urban landscape. The second aim of this paper is to look at the mental health of the population of Washington, D.C. and, wherever possible, break down the mental health statistics by district to get a better understanding of what mental health issues are most prevalent in the city. Finally, this paper will seek to determine if there is any link between the urban design of D.C. and the mental health of its population. This is much easier said than done, as there is limited information on mental health statistics, and varying types of language used to describe mental health-friendly urban design. It is important to note that as the nation’s capital, Washington D.C.’s land ownership is divided. Some parts of the city are federally owned lands, others are the city’s lands, and much is privately owned. This paper will focus primarily on the lands that are under the control of the D.C. Office of the Mayor, with some focus on the federally owned parks. The policies of interest for this paper put forth by the Office of the Mayor fall into two categories. Either they explicitly mention mental health, but they do so in the context of mental illness, or they discuss strategies which have an implicit connection to mental health, such as designing greener spaces, encouraging active movement, or supporting an aging population which wishes to be self-supporting. For example, in its Community-Based Mental Health Action Plan for the District’s Youth and Young Adults, the D.C. Department of Mental Health (DMH) commits to “developing a system that supports individuals with mental illness in integrated, community-based settings” (DC Department of Mental Health, 2012), but does not have a similar statement addressing people who do not have explicit mental health needs. This case study was developed using the Centre for Urban Design and Mental Health methodology based on the GAPS framework. GAPS stands for Green places, Active places, Pro-social places and Safe places. It was developed with the notion that these types of places have been demonstrated to be beneficial for people's mental health, and that the more components a city has, the better-equipped its population for mental health resilience. This paper will explore the many ways in which spaces can fit into the categories of green, active, pro-social, and safe spaces. In order to begin to understand the historical and contemporary urban design of Washington, D.C., I spoke with representatives from various departments under the Mayor’s Office, such as the Department of Transportation and the Office of Disability Rights, as well as urban planners who were involved with projects in D.C. From these interviews, I gained the names and contact information of other people who might have relevant information, whom I then contacted. Through these conversations, I developed a more holistic understanding of the city from multiple perspectives, and a solid foundation of the history of D.C.’s urban design. Many of the people I spoke with also recommended specific documents to help me in my understanding of D.C.’s urban design, such as the Comprehensive Plan, which I read and searched through the references for further reading. Finally, I spoke with professors in the urban and regional planning department at the Georgetown University School of Continuing Studies, who provided information and further readings on designing for mental health in Washington, D.C. I then used these readings as a starting point to find further readings. These conversations and readings, collectively, informed my background of Washington, D.C.’s urban design and mental health landscape. In 1790, Congress passed the Residence Act, which authorized a federal district along the Potomac River that would ultimately become Washington, D.C. President George Washington commissioned Pierre L’Enfant, a French-American military engineer and urban planner, to design this new city. L’Enfant devised a master plan for the city, laid out in a gridlike fashion, with wide streets, large open spaces for public gatherings, and impressive monuments and buildings. At the center of the plan would be a 400-foot-wide “grand avenue,” which later became the National Mall. He envisioned people mingling on this grand avenue and participating in civil discourse (Fletcher, 2008). In 1901, the U.S. Senate created the McMillian Commission, which used L’Enfant’s original city plan as a basis for the final design implementation of Washington, D.C. The commission was responsible for the planning of the system of parks that is in D.C. today. When construction began, much of the area was swampland and farmland (Gray, Urban design and mental health in Washington, D.C., 2018). Workers had to clear the land for the Mall and drain the swamp (Fletcher, 2008). D.C. was designed to mirror a vision of a prosperous and growing country. When the streets were built, they had to take into account the natural topography and vistas, making sure that the views were broad enough to see the large monuments around the city. The greatest emphasis was placed on the National Mall and the area surrounding it. The original planners did an excellent job of creating the heart of the city, but as the city expanded and different populations moved in and out, the same level of care was not taken to develop and beautify the rest of it. As a result, the challenge facing urban planners today is to put the same level of care into the surrounding neighborhoods (DC Office of Planning, 2011). Washington D.C. is surrounded by the states of Maryland to the northeast and Virginia on the southwest. It covers 68 square miles. At its center, it is mostly flat, with low hills to the north and south. The Potomac river separates D.C. from Virginia, and the Anacostia river runs through the eastern section (World Atlas, 2012). 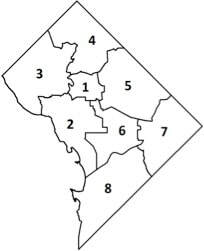 Washington D.C. is divided into 8 wards (Figure 2). Historically, the Anacostia River has been a marker of a significant socioeconomic divide, though the demographics of the populations within each ward have also been distinct from one another. The area of land that is now much of Ward 8 was farmland during the time that the National Mall was being built. It was one of the first suburbs of D.C., founded in 1854 (Office of the Mayor, 2017). Figure 2: Map of D.C. by ward. Source: D.C. Office of Planning. Throughout D.C.’s history, the greatest emphasis has always been placed on beautifying and developing the heart of the city, to the West of the Anacostia. As a result, the National Mall has become a widely recognized landmark of D.C. These efforts have often times pushed aside efforts to make similar improvements to the infrastructure of Wards 7 and 8, to the East of the Anacostia, creating inequity in investment in D.C.’s urban design. In the past decade, the demographics of several neighborhoods have changed significantly. Shaw, Bloomingdale, and Navy Yard, in Wards 1, 5 and 6 respectively, are prime examples, having all experienced a major influx of working-aged adults, new infrastructure, job creation, and economic growth. However, one negative side effect of these positive social and economic gains has been the gentrification of these areas, with the original residents often being pushed out by rent increases and higher cost of living (NPR, 2017). This displacement of long term residents, many of whom grew up in the surrounding neighborhoods and have strong ties to the larger community as a whole through institutions such as school, church and extended family networks, could also result in a loss of social capital, leading to fewer “eyes on the street” who know what to look for. Perhaps no region of D.C. has seen more rapid demographic change than Navy Yard. Located in Ward 6 in Southeast D.C., it is bordered by the Anacostia River on its southern border. From 2006 to 2015, the proportion of White residents in Navy Yard increased by 29 percent, the proportion of households earning over $100,000 increased by 18 percent, and the proportion of residents aged 22 to 34 increased by 15 percent (DataLensDC, 2017). These sociodemographic developments are examples of how parts of the city can rapidly change in a matter of years, changing the very landscape of those areas. Currently, the population of Washington D.C. is 47.1% Black or African American, 36.8% White (non-Hispanic), 11.0% Hispanic, 4.3% Asian, 0.6% American Indian or Alaska Native, and 0.1% Native Hawaiian or Other Pacific Islander (United States Census Bureau, 2017). In 2017, Washington D.C. had a population of 693,972. This was the highest it had been in four decades, largely due to the high yearly influx of new residents. These have primarily been White, working-age adults earning high incomes. However, the new residents have not moved into all parts of D.C.. Rather, there has been a trend in a change in proportion of White residents within certain wards and not others. Furthermore, gentrification of what had been primarily Black neighborhoods has also changed the demographics of the wards over the years. From 2006 to 2015, D.C.’s central and Northeastern neighborhoods experienced an influx in White, wealthy, working-age residents, while proportions of White residents decreased along the western edge of the city, West of Rock Creek Park and East of the Anacostia River (DataLensDC, 2017). During the same period, household incomes rose in almost every district, with especially high increases in the center of the city, such as Navy Yard and the Shaw and Howard University neighborhood clusters. East of the Anacostia River, several neighborhoods experienced a decrease in households earning over $100,000 a year. The overall picture is that in many neighborhoods that were already very high income, income continued to rise, while in areas with smaller proportions of high income earners experienced a further decline in wealth. 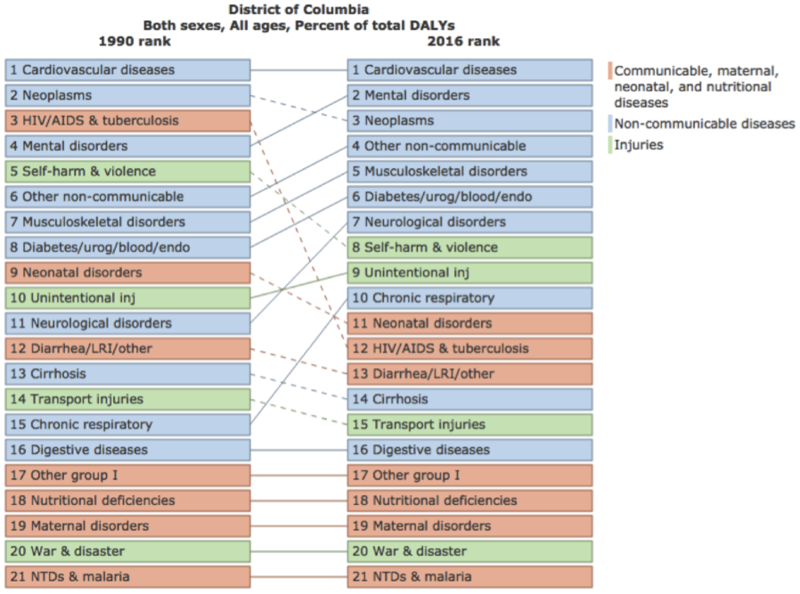 Mental health and substance use disorders are the second leading cause of Disability Adjusted Life Years (DALYs) in D.C., after cardiovascular diseases (Figure 3). Fifteen percent of total DALYs in D.C. are caused by mental health and substance use disorders, and this number is on the rise (University of Washington, 2018). Between 1990 and 2016, DALYs attributable to mental health and substance use disorders increased by 75% (University of Washington, 2018). The demographics of Washington D.C. are changing, and with those changes come shifts in the burden of disease. The last decade has seen a steady increase in the proportion of the population that is of working age. Among 15-49 year-olds in D.C. (which account for the largest proportion of the population, mean age 33.8), mental health disorders are the number one cause of DALYs, accounting for 29.57% of total DALYs. In 2018, an organization called Mental Health America created a “State of Mental Health” document for the United States, broken down by state. The document shows the prevalence of mental illness in the United States. The data collected were grouped into the following categories: Adults with Any Mental Illness (AMI); adults with dependence or abuse of illicit drugs or alcohol; adults with serious thoughts of suicide; youth with at least one past year major depressive episode (MDE); youth with dependence or abuse of illicit drugs or alcohol; and youth with severe depression (2017 state of mental health in America - Prevalence data, 2018). This document is one of the only comprehensive analyses of prevalence of mental illness in the U.S. broken down by state. In order to have an understanding of what Washington D.C.’s primary burden of mental illness lies, and to see how it compares to the nation, an in-depth analysis and summary of the document is necessary. First, it is important to define the terms used in the “State of Mental Health” document. Adults with Any Mental Illness (AMI) is defined by SAMHSA as “having a diagnosable mental, behavioral, or emotional disorder, other than a developmental or substance use disorder” (Substance Abuse and Mental Health Services Administration, 2016). These can range from mild to severe. Adults with dependence or abuse of illicit drugs or alcohol includes those dependent on “marijuana/hashish, cocaine (including crack), heroin, hallucinogens, inhalants, or prescription-type psychotherapeutics used non-medically” (Substance Abuse and Mental Health Services Administration, 2013). When referring to youth with at least one past year major depressive episode (MDE), a major depressive episode is characterized by two or more weeks of feeling depressed, losing interest or pleasure in daily activities, and having difficulty sleeping, eating or concentrating (Substance Abuse and Mental Health Services Administration, 2016). Adults with serious thoughts of suicide is measured on an as-reported basis. Finally, youth with severe depression are identified as those who report experiencing difficulties in school, home and in relationships (2017 state of mental health in America - Prevalence data, 2018). For the “State of Mental Health” rankings, the numbers range from 1 to 51 (reflecting the 50 states plus the District of Columbia). Higher numbers indicate worse outcomes. D.C. ranks 30th in terms of adults with AMI. 102,000 people, or 19.32% of the population, have any mental illness. This is slightly higher than the national average of 18.29% (43.7 million Americans). D.C. ranks the worst in terms of dependence or abuse of illicit drugs or alcohol, in 51st (last) place. The prevalence of dependence or abuse of illicit drugs or alcohol is 12.51% in D.C., as compared to 8.47% nationally. That translates to 66,000 people in D.C. The District ranks 16th in terms of adults with serious thoughts of suicide, with 3.91% having seriously contemplated suicide, or 21,000 people. This is about the same as the national average of 3.94%. The percentage of youth reporting at least one past year major depressive episode in the past year across the United States has been increasing. D.C. has the lowest prevalence, at 8.69%, or 3,000 youth, as compared to the national average of 11.01%. However, it is certainly possible that a percentage of depressed youth go undiagnosed and untreated, especially in lower socioeconomic settings, where fewer resources are available. D.C. ranks 3rd in terms of its percentage of youth who have reported a severe major depressive episode, with 5.5% prevalence (2,000 people), as compared to a national prevalence of 7.4%. However, the District ranks 41st in terms of youth with dependence or abuse of illicit drugs or alcohol. Currently, 5.63% of youth in D.C., or 2,000 people, struggle with alcohol or drug problems, compared to the national average of 5.13% (2017 state of mental health in America - Prevalence data, 2018). In sum, as compared to national averages, D.C. ranks the worst in terms of dependence or abuse of illicit drugs or alcohol among both adults and youth. D.C. also has a worryingly high proportion of its population of adults with any mental illness. To further complicate the problem, it is important to note that mental illness is difficult to track and measure because most of the time, mental health issues are not visible on the outside and the data are mostly based on self-reported measures. So, these numbers could be far off from the actual numbers of people in D.C. with these health conditions. There is not very much data available for mental health statistics in D.C. on a by-ward basis. However, D.C. does participate in the Behavioral Risk Factor Surveillance System (BRFSS), an annual, nationwide survey conducted over the phone that collects health data from residents in the fifty states and the District of Columbia (CDC, 2018). Results of those screenings in D.C. can be broken down by ward. The 2015 BRFSS screened for adults who had been previously diagnosed with a depressive disorder and found that 18% of D.C. residents had been diagnosed at some point in their lives (DC Department of Health, 2015). When broken down by Ward, however, there were significant disparities, with 15.9-16.2% of residents in Wards 1 and 4 reporting having been diagnosed with a depressive disorder while 22.5-25.9% of residents in Ward 8 reporting having been diagnosed. These numbers are particularly striking considering that Ward 8 has the lowest access to primary care physicians who would make the diagnosis, and that even though White residents are slightly more likely to have been diagnosed with a depressive disorder than Black residents (19.4% vs. 18.7%, respectively), Ward 8, which is 92.8% Black, still had the highest rates of adults who were diagnosed with a depressive disorder (DC Department of Health, 2015). Figure 4 demonstrates diagnosis of a depressive disorder in adults by ward. Depression diagnosis only tells a fraction of the story. Mental Health America also conducted a screening of depression in 2017 using phone interviews to survey a representative sample of participants from the 50 states and D.C. In addition to being asked whether they had been diagnosed with a depressive disorder, respondents were also given the Patient Health Questionnaire-9 depression screen which measures depressive symptoms. Respondents could then be categorized as having minimal, mild, moderate, moderately severe, or severe depression. Startlingly, 70% of respondents who had moderately severe and severe depression according to the screen reported never having been diagnosed by a medical professional (Mental Health America, 2017). This statistic demonstrates that the numbers obtained through looking solely at diagnosed cases are most likely a gross understatement of the true burden of mental illness. Aside from the “State of Mental Health” and BRFSS data, little is known about per-state or -city mental health. However, there are proxies which can serve as indicators of mental health more generally. Homelessness is one such indicator. Homelessness and poor mental health are closely tied. It is difficult to know what the general population’s mental health outcomes are because many people often go undiagnosed, but the population of people experiencing homelessness can sometimes serve as a proxy for the severest of cases since having a severe mental illness can make it difficult to keep a job and perform other functions necessary for keeping a home, thus leading many people with mental illness to eventually become homeless. By some estimates, between 30 and 50% of people experiencing homelessness have a severe mental illness, mainly psychoses, acute anxiety and personality disorders (Scott, 2018). Substance abuse comorbidities, such as alcohol or drug dependence, may be as high as 70% among the homeless (Salkow & Manfred, 2003). Homelessness then further exacerbates mental illness, as people are left feeling powerless and robbed of their dignity (Burn, 1992). This becomes a vicious cycle that keeps people on the streets instead of getting them treatment to break the cycle of homelessness. One of Mayor Bowser’s priorities was to close down D.C. General, D.C.’s main homeless shelter, and replace it with smaller shelters, one in each ward. However, things did not go as planned and although D.C. General shut down, the new shelters were not opened in time, leaving many on the streets (Murphy & Tseu, 2018). Homelessness is not equally distributed across the wards of D.C. Unemployment, a risk factor for becoming homeless, is 17% in Ward 8 and 19% in Ward 7. In comparison, it is 4% in Ward 2 and 3.4% in Ward 3 (Office of Planning and Department of Energy & Environment, 2012). Poverty, another factor which is closely correlated to homelessness, is similarly divided among wards. 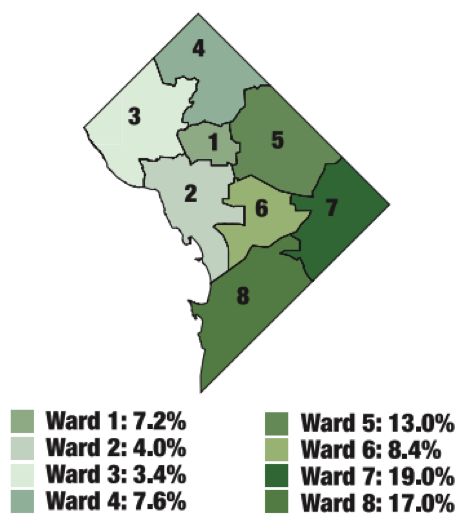 35% of Ward 8 residents and 26% of Ward 7 residents live in poverty. In contrast, 6.9% of residents in Ward 3 and 9.9% of residents in Ward 4 live in poverty. Figure 5a: Unemployment by ward (2005-2009). Source: Sustainable DC. Figure 5b: Poverty prevalence by ward (2005-2009). Source: Sustainable DC.